This year Mainstream Renewable Power Chile had the opportunity to team up with PROLOA, the development corporation of the El Loa Province in northern Chile, to co-host their 17th anniversary celebrations. PROLOA is a private non-profit organisation based in the northern Chilean province of El Loa. Their work hinges around the areas of Education and Culture, the Environment, Training and Technical Consulting and Community Development. Together with their partners, they aim to promote the sustainable development of communities based in this region. Mainstream Renewable Power Chile joined in 2016 when the company began development on two wind farms located in this region. 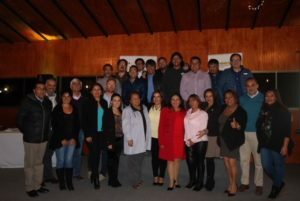 Since then, Mainstream has developed and rolled out a number of very successful community initiatives with the help of PROLOA, such as a six-month community program that was carried out in Antofagasta. As an active partner of the corporation, Mainstream was invited to co-host this year’s anniversary celebrations. Members of the regional media were invited to attend the event, where they received special recognition for their role in promoting PROLOA as a pioneer in regional development. This also gave the local media a chance to learn more about Mainstream Renewable Power and their work in the renewable energy sector. Mike Nolan, one of the Managers of the company’s northern projects spoke about the importance of this event: “This was a really good opportunity for us to get together as a group. We are all working towards the same goal: to make Calama a better city. We would like to thank the media for their participation in this event and for their enthusiasm in getting to know more about our company.” Mainstream is active in this region with the Tchamma Wind Farm project, which is located 16.5 kilometres to the east of the city of Calama and will have an installed capacity of 272.5 MW, and the Ckani Wind Farm project, 45 kilometres to the northeast of the province’s capital city with a total installed capacity of 108 MW.